On Tuesday, a statue of the Ten Commandments was installed at the Arkansas Capitol grounds. Less than a day later, it had been run over by a car and destroyed. 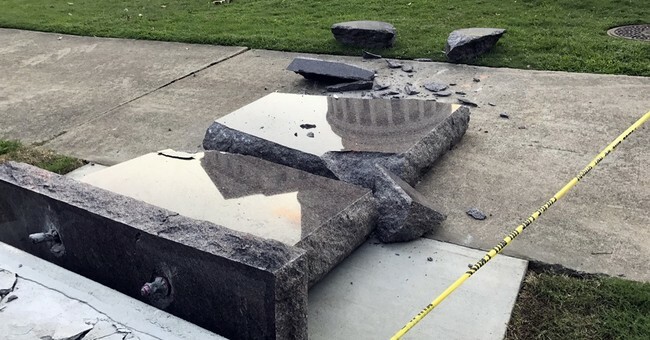 Michael Reed, a 32-year-old from Van Buren, Arkansas with a history of mental illness, recorded himself ramming his car into the monument, shouting "freedom" shortly before impact. Reed has previously been accused of destroying a similar Ten Commandments monument in Oklahoma. He was arrested shortly afterwards. He is facing charges of of defacing objects of public respect, trespassing on Capitol grounds and first-degree criminal mischief. He's being held without bail. Additionally, Reed made threats against former Presidents George H.W. Bush, Barack Obama, and George W. Bush on his Facebook page. Prior to his arrest, Reed created a GoFundMe page to crowdfund money to repair his car. He was seeking $20,000. The page appears to have been taken down and is not available. The monument was paid for by private donations.